In my last article, I went over the initial work for valuing players in a basic fantasy league (12 5×5 teams with 23 roster positions). Each league has its own unique rules so the procedure may need to be adjusted accordingly. Today, I am going to finish the positional rankings and begin to come up with an overall ranking. With these equations, I like to stop and run a quick value test so I have a general idea of each value’s weight when comparing players. With counting stats, the weights are easy since the average values can be divided by each other. For hitters it works out to about: 1HR ~ 1SB ~ 3 RBI ~ 3 Runs. The problem arises with AVG because it has two inputs, hits and at bats. Take two hitters, one hitting 10 points below the league average AVG with 300 projected at bats and one hitting 10 points above with 200 projected at bats. 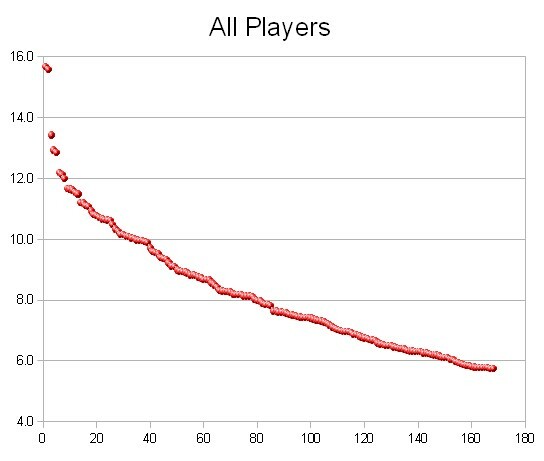 While both are differ from the mean value the same amount, the player with 300 PA will have more weight and drive down the average more. So for the following values I assumed a 550 AB player, 200 IP starter, 60 IP reliever. A difference of 10 K for a 60 IP reliever is a huge jump therefore the other stats can be off by more. For the next major step, each person has to come up with a projection for each player. Some people believe they should go through every single player and create a projection (see Mike Podhorzer’s book). Also, a person can download and use an industry projection set such as Steamer (Link to Steamer Projections – click on Export Data). I use the combination of 3-4 projections to get a consensus projection and then look for player I disagree with (I mainly look for changes in playing time at this point). Once I have a set of projections in a spreadsheet, I use the above two equations to get the final SPG values. Using these formula’s here are the top rated hitters and pitchers. For pitchers, I just divide them into starters and relievers and just put them to the side for now. If a pitcher doesn’t have a defined role, I put them with the starters, but it usually doesn’t matter since they are marginal players anyway. The one issue with this data is positional “scarcity” is not taken into account. I went ahead and grouped the players into position groupings and ranked the players according to each position in this order (min 5 games at a position). At this point, I can send the positional rankings to Eno and he can cage back up the socky monkey. From now on, the following steps should be done to get an overall value ranking. Keep these rankings handy because three items need to be done to . Note: Originally, I used the incorrect values. Corner Infielders and Outfielders had higher values than the Utility value, so I needed to use the minimum utility value for all three replacement level baselines. These values are far from my draft order and I will go over a draft plan with them in tomorrow’s article. The second item I do with the rankings is create a graph with the rank on the x-axis and the adjusted SGP value on the y-axis. Here are overall and outfield graphs. What I am looking for is huge drops in talent from one player to the next such as happens from the 13th to 14th outfielder spots or after Trout and Cabrera. I take this information and mark on my draft sheet where the talent drops off at each position and with the overall rankings. 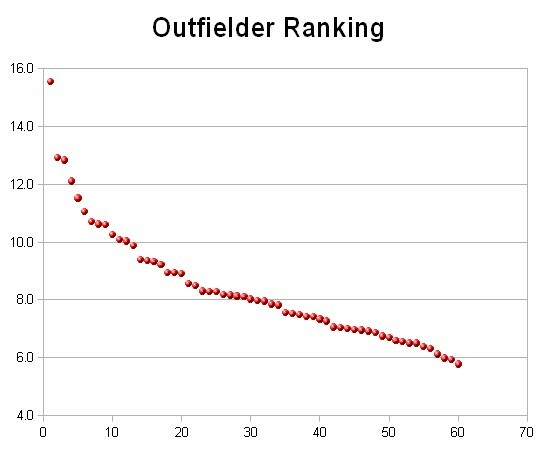 If an outfielder and second baseman have the same value, but the next second baseman’s value is significantly lower and three outfielders are almost the same, take the second baseman and hope one of the outfielders makes it back to your next pick. Make sure foreign players on ranked like Jose Abreu. If the player doesn’t have a projection, it is time to do your best to create one. Adjust playing time for any recently injured players like Cole Hamels or Hisashi Iwakuma. Look to see if any player sticks out and you don’t feel right about the ranking. If you use a projection, go back and see if you disagree with it and adjust the player’s production. Don’t and I repeat don’t just change the ranking. You may feel good about the player, but it doesn’t mean you should over pay for less production. Look to see if any players were not included and you feel they should be. Again, see if their projection needs adjusted. Well, I am finally done for today and let me know if you have any questions. Tomorrow, I will look at how I set up my plan when it comes to drafting. We hoped you liked reading Fantasy Rankings Prep (2 of 3) by Jeff Zimmerman! I think Steamer got re-adjusted after I ran the numbers. The catchers I don’t like their rankings, but will work good with tomorrow’s article on a draft plan. The Mauer ranking is being driven by his fatally flawed positional adjustments.